H08051 Features: -Dual fuel, extended run time generator. -14 Hour run time. -Hybrid Series collection. -8 Gallon fuel tank with integrated fuel gauge. -Includes extended propane hose (5ft) for convenience when running off a larger propane tank. Finish: -Black. Primary Material: -Steel. Maximum Wattage: -10000 Watts. Dimensions: Overall Height - Top to Bottom: -26.5". Overall Width - Side to Side: -28". Overall Depth - Front to Back: -31". Overall Product Weight: -221 lbs. 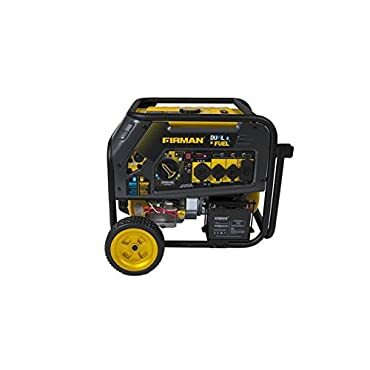 Firman Power Equipment Dual Fuel 10,000/8,000 Watt Generator - Black. The FIRMAN H08051 generator features 10,000 starting Watts and 8,000 running watts (9050/7250 LPG). Our Whisper Series muffler keeps the H08051 running at a quiet 74 decibels well below the standards set by the National Parks Service, and our spark arrester has been approved by the USDA Forest Service. All our Hybrid Series Generators run on gasoline or propane fuel, giving you flexibility while out on the road or during an emergency. H08051 comes standard with extended propane hose (5.5ft) for convenience when running off a larger propane tank. Run on gasoline or propane fuel, giving you flexibility Extended propane regulator/hose (5.5ft) Best in industry 3 Year Warranty Largest tank in the industry with extended run-time USDA Forest Service Certified Spark Arrester While we aim to supply accurate product information, it is sourced by manufacturers, suppliers and marketplace sellers, and has not been provided by Overstock. Coupon Details: Get this special eBay deal with 20% off at eBay during PayPal checkout (max. discount of $100) when you enter coupon code JOE4WORX at the bottom of the final Paypal payment/confirmation page. This coupon applies to orders of $25.00+.